I have a slight problem with accessibility. I have no issue with those with disabilities but here is my problem. They are not primarily my user. I build recruiting sift questionnaires for international clients. These are all hosted online. All our candidates are doing the same basic question/answer test for one reason; we can't create interactive experiences because of our WCAG2.0 Level A commitment. When asked, clients want interactive experiences which push the boundaries and are 'cutting edge'. And we respond, but what about your candidates with disabilities? When we look at the data, fewer than 0.1% need additional help. This help involves additional time to complete the online assessment or have them travel to an assessment centre to do a test face-to-face or skipping the sifting process completely. Instead of a text question with options, a user could be playing on-screen, complete puzzles, word finders, crosswords. We could involve swiping images, drag and dropping of shapes, sorting words, etc. So my question is ... wouldn't it be better to design amazing rich interactive experiences for 99.9% of the users to enjoy and engage with (disregarding WCAG2.0)? And, meet the needs of the blind/impaired users in another way? I would love to hear your thoughts. Remember these aren't public tests. They are for job applicants and known individuals, albeit millions of them. Everyone can be or will become disabled over time. 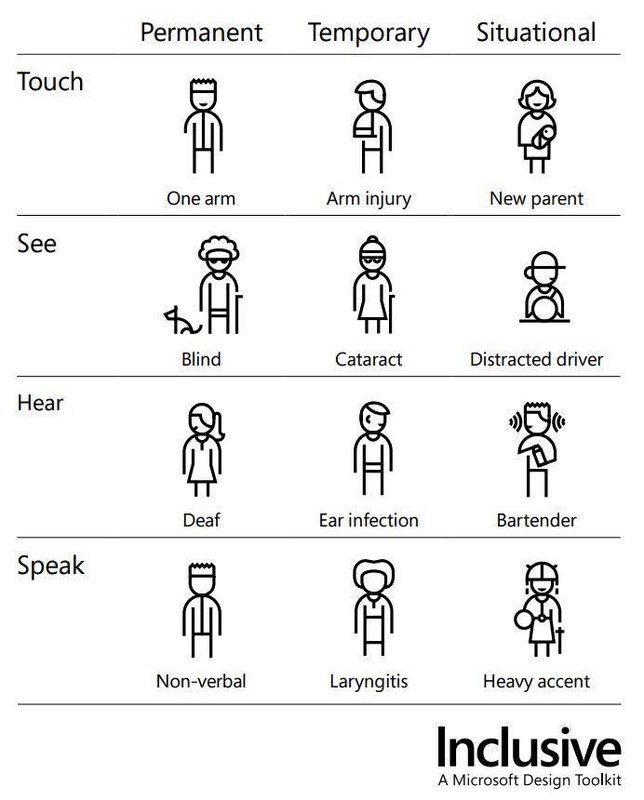 Microsoft's Inclusive Design principles have very good examples of this. Even if you know that the majority of your users have no additional needs right now, you have to think about what you want them to experience when things change. What if a perfect candidate user breaks an arm? Do you want them to be unable to use your product for 6 weeks or more? What if they never come back or miss their recruitment window during that time? You don't have to make all the edge cases equally useful at all levels of accessibility, but you should consider if there are ways to make your core use cases available regardless of if a user has additional needs. There is also something to be said for Universal Design Principles where by designing for the least able you make things better for everyone. Firstly, do you know why only 0.1% of your users have additional needs? Can you guarantee that it's because they are not interested in your product or could it be that they cannot use your product so don't? If you can answer that question with certainty then you're part of the way to finding the answer to your original question. The second question you need to ask is this: can you guarantee that no-one with additional needs will ever use your product in the entirety of it's lifetime or might you need to build in some provision for future users? The last question you need to ask is this: is it fair that anyone is excluded from your product for any reason? This is more tricky because some things are obvious (government services for example) and some things are much less obvious (entertainments for example). So, you need to find out why it's 0.1%, find out if that number could change, and find out the value of that 0.1% now and in the future. By the way, you didn't state the size of your user base but, at 1,000,000 users your 0.1% would be 1,000 users - Something worth thinking about when you're considering the impact they could have on things like NPS and other ratings. And, meet the needs of the blind/impaired users in another way? As long as you're able to do that it's fine to provide an interactive experience for non-impaired users. If "meeting the needs in another way" meens exluding them from using your website, then the answer is no that's not an option. So 99.9% is able to have an excellent user experience while 0,1% will not be able to use it at all? There is no ultimate reason why that 0,1% should be counted in. Nor is there an ultimate reason why you should ignore them. When ignored, 1000 on 1 million people are discriminated. Do they mind? Do you mind? It’s completely up to you what to decide. Do you know what the consequences are if you choose to go this route? And do you know what the consequences are if the product is not cutting edge? The conclusion here is that the answer greatly depends on research and business goals. It can’t really be asked to somebody not involved. I think web accessibility has some aspects that can be considered an ethical dilemma but also is a legal responsibility and this is a good reason to consider it. "Businesses that have an online presence should provide accessibility to disabled users. Not only are there ethical and commercial justifications for implementing the Web Content Accessibility Guidelines, in some countries and jurisdictions, there are also legal reasons. Under UK law, if a business's website is not accessible, then the website owner could be sued for discrimination. ["Disabled access to websites under UK law". Out-Law.com. October 2011. Retrieved 15 January 2015.]" Not the answer you're looking for? Browse other questions tagged usability accessibility wcag recruitment or ask your own question. What do you wish you had known before your first ever user evaluation workshop? What is the best way to bring your old users to your new site? Accessibility: How to track peoples with disabilities on websites?